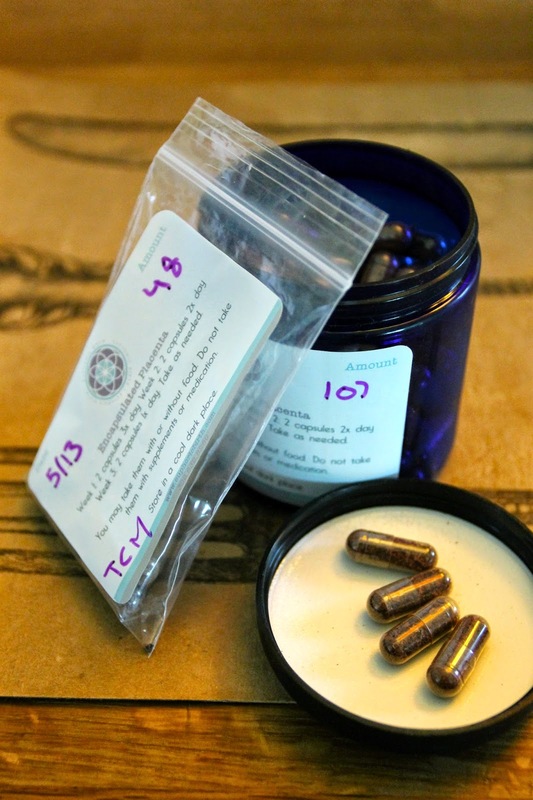 When I became pregnant, I knew that placenta encapsulation was for me. I have had issues with anxiety in the past, and I didn't want the loss of all those hormones during pregnancy to become an issue for me...I could imagine nothing worse than being anxious and trying to care for a newborn. The postpartum period can be rough for a lot of women, and for me, the best thing was to be proactive. Going in, I was excited to give the practice a try. I found someone locally who did the encapsulation, which was great because she came to the hospital the day my daughter was born and picked up the placenta. She then encapsulated it and brought it back to me at home five days later. I chose to go with two different forms of encapsulation, both Traditional Chinese Medicine (TCM) and the raw version. The TCM version is steamed with herbs and then dehydrated, and the raw version is just the placenta sliced thin and then dehydrated from the "raw" state. I began with the TCM version, which is good for people with a history of anxiety and depression and when those ran out, I switched to the raw version. I gave birth on a Monday and the pills arrived on Friday. The timing could not have been more perfect. Following the birth, I had a couple of episodes of mild anxiety. One happened Tuesday morning when I wanted to leave the hospital. I became anxious that we wouldn't be discharged, and I was very eager to go home because I couldn't sleep in the hospital. I had a few more little episodes--not full-blown panic attacks--throughout the week, but I noticed that if I cried when they came on, they left pretty quickly. I had a lot of emotion built up that I know needed to come out, so I had to give myself permission to release it, which is hard for me. But fast forward to Friday and my milk had come in. That was quite an experience, let me tell you. It's painful and confusing and my breasts had become so engorged that I was having trouble getting the baby to latch on. I was also told that about day five, you really begin to notice the loss of all those hormones. I cried the whole day. I was so distraught that I needed my mom to come and stay with me for two days while I got the hang of nursing. I was very lucky that she was so helpful--even manually helping me squeeze my breasts to help the baby latch. At this point, I became a little afraid to take the placenta pills because I was afraid that they would make my milk come in even more (I had read about this in other women.) That was when I had to tell myself: take it one dose at a time (you take them three times a day to start), and if at any time you don't like it, just stop. But it didn't make my milk come in stronger, and the anxiety and tension I was feeling began to subside within a day or two. Within a week, I was really beginning to feel like myself again, which was practically a miracle! When the TCM pills were done (there were 48 of those) I switched to the raw, which are supposed to give more of a burst of energy. I really like it. I am still taking them (down to once a day now) and I feel that they have made a lot of difference. I mean, a lot has changed in my life in such a short amount of time, and normally I would freak out just a little (okay, a lot!) Instead, I feel like I am able to take things one day at a time and enjoy the time with my daughter and all this monumental change. I get puked on, and I laugh. Diaper explosion? No sweat. Do I still have days where I cry? Of course I do. I am told that it's normal, even if it is not how I was previous to having my daughter. Yes, I still get overwhelmed when we have a really bad night and The Bird doesn't sleep...sometimes I cry while she cries. We need our cries. But it doesn't go on for days on end and it isn't accompanied by a feeling of hopelessness or anxiety. Just tears. Best of all, I haven't felt the paralyzing effects of anxiety that I feared so much. Especially during that first week. I was nervous that it might all creep up on me again, but thanks to the placenta encapsulation, I really feel the tide of anxiety was reigned in. I would highly recommend this process to anyone who is giving birth. I know it made a difference for me, and I know that it made this time during my maternity leave more enjoyable. For more information about placenta encapsulation, please visit the Euphoric Birth website.